Terrific springy egg noodles without a trace of ‘kan sui’ (lye water/alkaline water); served atop a bed of crunchy ‘choy sum’, and lightly flavoured with a savoury ensemble of sauces. One glance at the title of this post, and you’d be tempted to think that Motormouth has gone bonkers. No, seriously, was down and out since Friday, after that disastrous lunch of bak kut teh infused with too much MSG. Either that herbal concoction or the vinegar pork trotters which was splendid flavoursome. But I shall never return again … unless necessary. Amidst the extremely chaotic environment (running out of wantan by 930am, anyone? ), this guy and presumably; his wife were a cool duo. Even catering to silly questions from these new customers of theirs. There was this morning during the long Raya-Merdeka break, when we decided to have breakfast. But of course, Ipoh being swarmed from all corners of the country; it’s a no-brainer that you shall not go to places that are perennial favourites of tourists (eg. the white coffee outlets, the dim sum street, etc). Thus, we opted for what we thought was a slightly off-beat choice. Comeson Restaurant (Kam San in Cantonese) opposite of Lou Wong and Onn Kee for their wantan mee. A relatively safe choice? Don’t bet your life on it. Barely 9.30am, and they have run out of ‘char siew’ (BBQ pork) and wantan (pork dumplings) …..
Thankfully, they still had sui kow (larger dumplings with minced pork, wood ear fungus, chopped carrot and yambean, etc) and braised spare ribs (pai kuat). The last few portions remaining! I was stunned. I knew they opened quite early and usually sold out by noon. But to imagine this was barely brunch and they have sold off almost everything. They are the only stall operating in the mornings. In the afternoon, you’ll see a very traditional Teochew economy rice stall; Mum fondly nicked him as “Ah Jik”. He sells a damn good vinegar pork trotters (ironically? ), and sometimes fabulous HUGE crabs cooked in a sweet and spicy sauce for a steal. And he makes great pork and salted fish patties too. Let’s not digress. Will cover that in a future review. Braised spare ribs that was a wonderful complement to the noodles. Bear in mind that the egg noodles was tossed in a very light sauce, unlike the usual combination with soy sauce, dark soy sauce, and a dash of sesame oil. 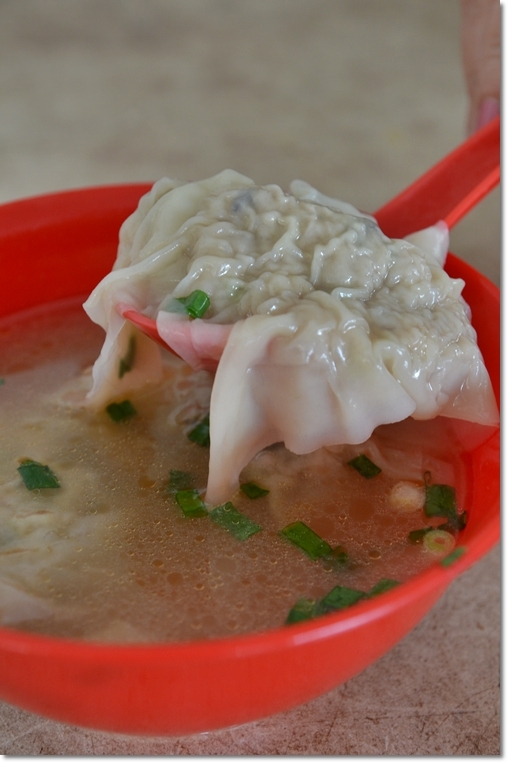 The lady was clearly in her elements that morning; wrapping the dumplings on-the-go! Can’t get any fresher than this? The highlight of the breakfast? The NOODLES, hands down. Though the spare ribs and ‘sui kow’ were above average, the noodles stole the limelight. Thinner strands of egg noodles cooked to a bouncy finish (QQ, al dente), every bite was a delightful crunch. Portion may be smaller than usual, thus you’d be forgiven had you ordered DOUBLE the portion and get away with crossing your diet regime. Comeson Restaurant – You probably will zoom by without even noticing this shop, for the banners for Lam Fong biscuits were way too distracting. Will definitely be back for the ‘char siew’ and wantan, though I’ll be sure to wake up much earlier that that morning. Geez …. can’t they do brunch hours as well? 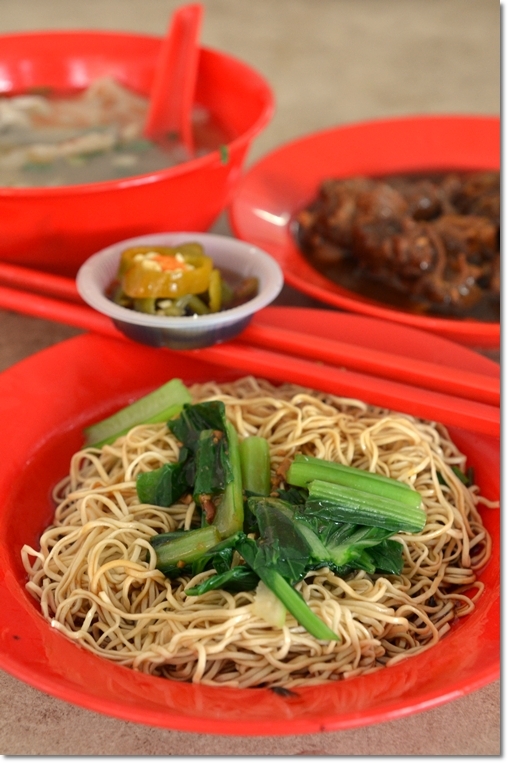 *Wantan Mee priced from RM2.40/USD0.80 onwards; comes in small, medium and large portions. Still lost and no idea where this place is? Opposite of THIS. If you have not heard of Lou Wong, then you’d better start reading now …. And a stone’s throw away from THIS. Wondering what they were lining up for? It’s the one and only Drive-Thru Tau Fu Fah, baby! Only this time, you can’t even drive through, but instead had to do a “walk-thru” … bad joke, I know. Still reeling from the after-effect of sleeping the whole Saturday off. So allow me to adapt to the immense sluggishness this Sunday morning. Gonna be a long long day ahead …..
Not allergic, but hate the unpleasant taste of kan sui. since when Ipohans like to queue up?? Hehe, those must be tourists lah! 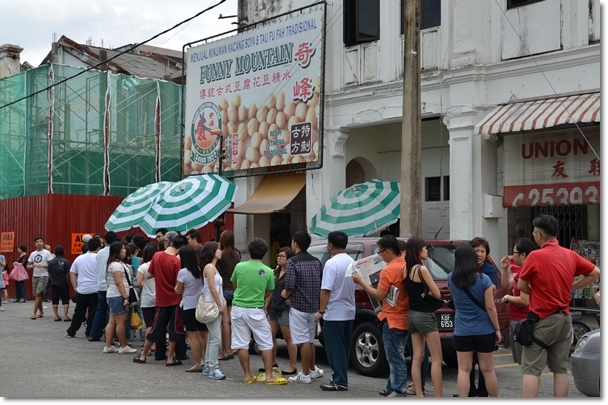 There was a queue like that outside the chicken rice ball shop in Melaka too. Yeah …. mostly in smaller towns like Ipoh, Melaka and Penang. 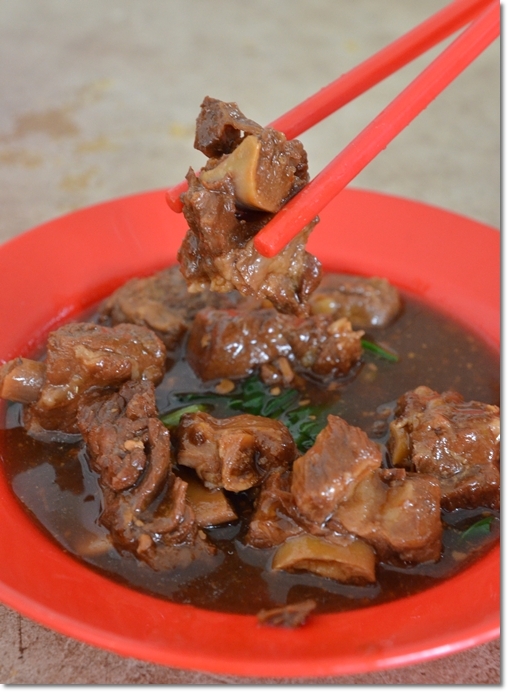 Can expect the city dwellers balik kampung and feast on their childhood favourites. Not Ipohans lah ….. unless you count me into the equation. Hehe …. have to lah, only can join the fray during festive seasons, I won’t give up the good fight. 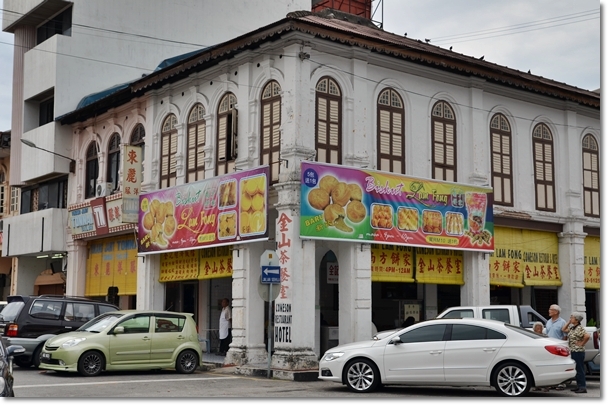 Writing on my favourite food haunts from Ipoh. 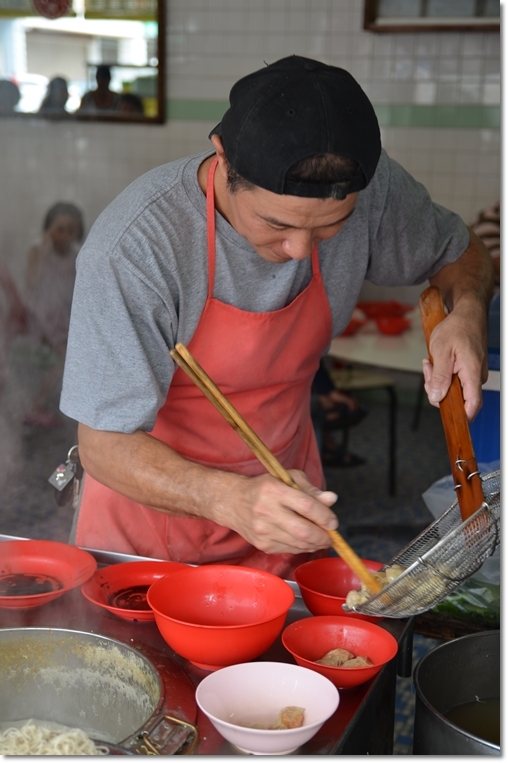 Ah Chee wantan mee is a third generation wantan mee seller. They used to stay in Panglima Lane and his grandfather’s stall and later his father’s stall used to be at the entrance to the lane between Kong Hing and Thien Chun. I am their family’s third generation consumer. My grandparents and mother used to frequent their stall. Ah Chee makes his own noodles and everything thing else he sells. He is my top choice for wantan mee. Thanks Tham. I can always count on you to come up with background stories like this… informational. His name’s Ah Chee? The noodles indeed, was top notch stuff. The guy owner really looks calm preparing the many bowls of noodles. Yeah … he was indeed very calm, smiling away even. Without losing his cool. Sometime I wonder why those hawkers don’t prepare more food during holiday seasons and you have to eat wanton mee without any wanton ……heheheh ! Hmm, maybe they did, yet they sold off faster than expected. You should have seen the queues everywhere around the area. It’s mad, yet mildly entertaining. 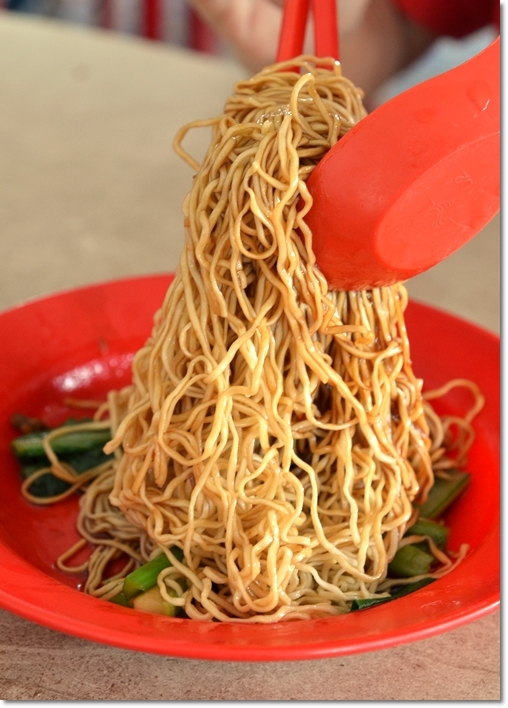 Oh i LOVE wantan noodles that are QQ al-dente … hard to find those around Klang Valley! Yeah, they make their own noodles, dumplings and basically everything else. Very crunchy, as opposed to simply bouncy. Ah Chee always sells out at the latest 10:30am. The rest of the day is for him to prepare his things for the next day and he insist that he should rests on Sundays. Its a lot of hard work. His eldest brother was my classmate and I know his whole family. Ah Chee and his wife love to travel and they go overseas at least twice a year. Talk to him next time you go there, he’ll love to talk with you. Okay, I’ll be sure to drop by again and talk to him. Maybe after he closes his stall for the day, since he’s quite busy throughout his operating hours. Do inform him of this review if you bump into him. Finally! I found him and his store, after last contact for 24 years. 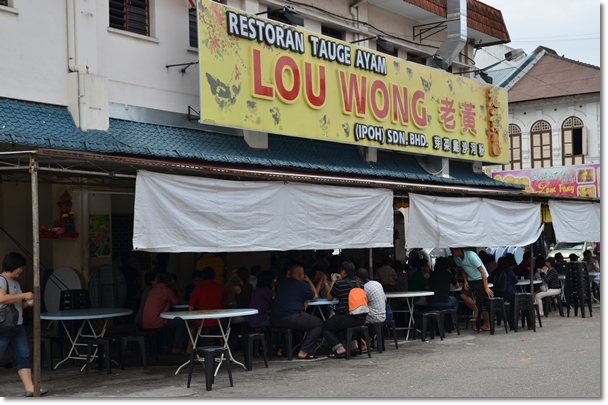 Remembering my first bowl of wonton noodle serving with green Choy Sum in panglima lane. Today noodles are much more delicious than before, choice of flavour spare ribs, BBQ pork, dumplings combination. His hardwork you will deserve more business growth. I will definitely come back for more bowls. Wahlau eh, queue with cars are okay lah, but on the feet!? I know Ah Chee and wife when I was a little boy, that’s about almost 25 years or so. But my mother knows both of them longer. She used to stay nearby his stall – near Market street – in the 70s. Yes, they used to have a store at the old Nam Heong near Concubine Lane in the 80s / early 90s before they moved to near Kampar Road behind the temple. In fact it his wife that taught her how to swim. After many years of not seeing them, they still somehow recognized me one day when my mum told me that they had moved back to downtown there. It’s the same look and taste of the noodles remains the same after almost a long time.